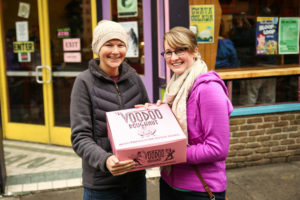 The Pacific Northwest is packed with popular destinations, ranging from natural wonders like Mount Hood to urban eateries like Voodoo Doughnut. 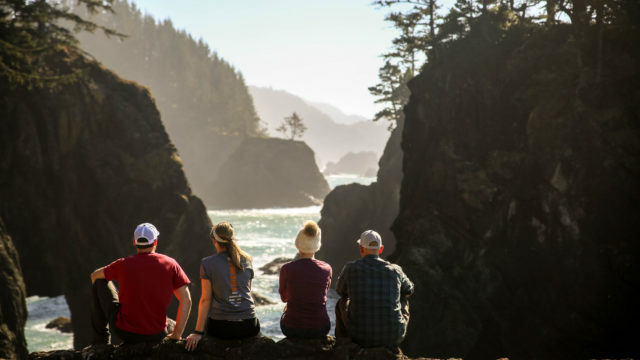 However, if you’re looking to break away from the typical tourist spots, explore these 7 hidden gem destinations in the Pacific Northwest today. If you want a true underground adventure, look no further than Ape Caves on the south side of Mount St. Helens. Ape Caves (upper and lower) are some of the longest lava tubes—tunnels formed by draining lava—in the world. At roughly a mile-and-a-half long, and requiring some scrambling, Upper Ape Cave is the longer and more challenging of the two, but the three-quarter-of-a-mile-long Lower Ape Cave is a worthy trip in it of itself. No matter which cave you’re visiting, remember to bring a jacket—the caves remain a constant 42 degrees—and a light source such as a headlamp or flashlight, along with a backup. Where to Stay in your ROAMERICA Van Rental: Low-key camping, along with hot showers and clean restrooms, can be found just down the road at Cougar Park and Campground. If you’re looking to a visit a place that’s out of this world without leaving the Pacific Northwest, then head to The Oregon Vortex in Gold Hill. Legend has it that Native Americans referred to this place as “forbidden” and early travelers’ horses would refuse to enter. Today, depending on your level of belief—it’s either a place where balls roll uphill and people grow (or shrink) depending on where they stand or a place where unique a unique visual phenomenon can be captured on film. Either way, put this strange spot on your list of hidden gems to unearth. 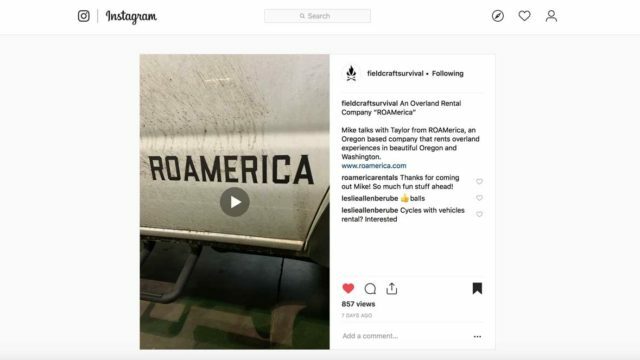 Where to Stay in your ROAMERICA Van Rental: Set up camp and relax after a super (supernatural, that is) day exploring The Oregon Vortex at Valley of the Rogue State Park, and enjoy level sites (no illusions) and a fantastic setting next to the Rogue River. Don’t be dissuaded by the short distance of the hike (it’s under five miles round trip and gains less than a thousand feet of elevation) to Little Mashel Falls or by the “little” in its name; this quick-hitting adventure delivers big fun and a huge 92-foot waterfall. Located in the University of Washington’s Pack Forest, in Eastonville, Washington, Mashel Falls is a fantastic four-season destination. 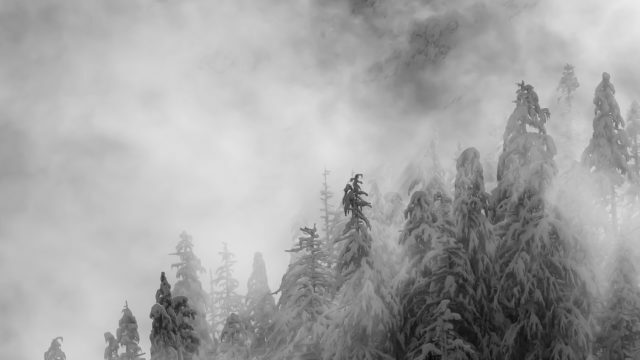 Winter and spring are the best time to appreciate the power of nature, as the water is at its highest and mist from the falls can soak unsuspecting visitors. In the summer, numerous swimming holes provide a perfect place for beating the heat, while the low water levels found in autumn make it the best time for taking photos (since there is no disruptive mist). Where to Stay in your ROAMERICA Van Rental: Year-round camping can be found a little less than ten miles away at Rocky Point Campground. Just south of Yachats, Oregon is Thor’s Well, a place where it appears the Pacific Ocean is being drained into the earth. 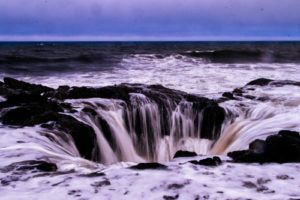 In reality, Thor’s Well is a hole carved out of the Basalt shoreline’s surface where waves rolling in from the open ocean enter underneath and bubble out the top, often in dramatic fashion. Check the tides before you visit—high tide is best for photographers, as Thor’s Well is at its most powerful, but low tide is great for getting an up-close look and discovering how the hole works. 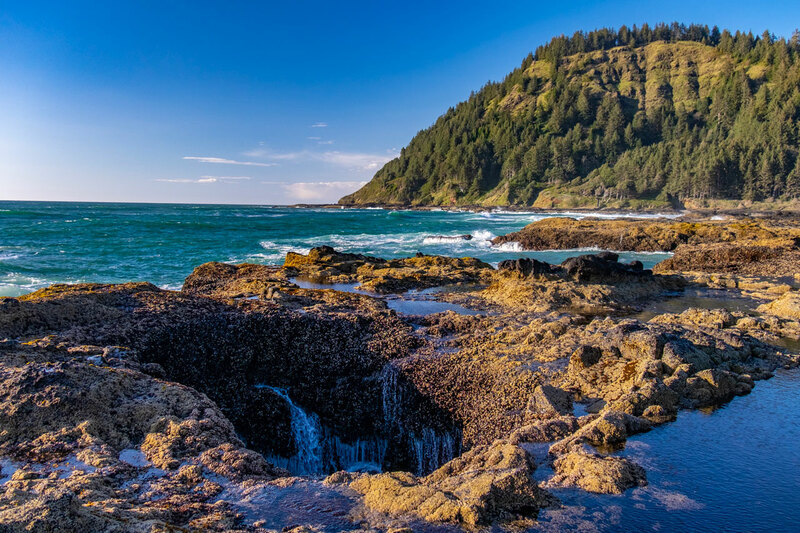 Where to Stay in your ROAMERICA Van Rental: Situated between the ocean and the forest, Cape Perpetua Campground is the perfect base camp for exploring this spectacular section of the Oregon Coast. The idea of visiting Stonehenge without having to get on a plane is what put The Maryhill Stonehenge Memorial on our list of 7 hidden gem destinations in the Pacific Northwest to explore. Located in Maryhill, Washington, the Maryhill Stonehenge Memorial was built as a tribute to the servicemen of Klickitat County and has the distinction of being the U.S.’s first World War I memorial. Although not a totally accurate representation—the rocks are made from concrete and the monument is aligned to the astronomical horizon as opposed to the actual midsummer sunrise—Maryhill Stonehenge Memorial is still an offbeat and interesting must-see spot. 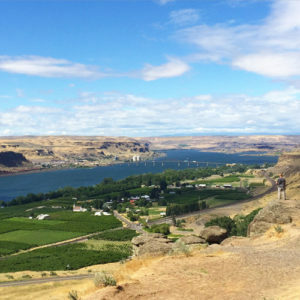 Where to Stay in your ROAMERICA Van Rental: Maryhill State Park is a short (approximately two miles) drive from the Maryhill Stonehenge Memorial and offers showers, restrooms, and, most importantly, a beautiful setting along the Columbia River. 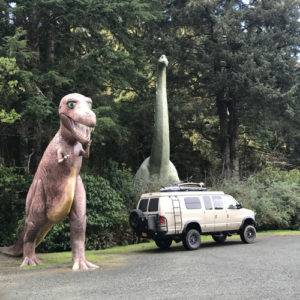 Travel back to a time when dinosaurs ruled the earth with a trip to Prehistoric Gardens, in Port Orford, Oregon. Take a self-guided trip on the well-maintained gravel paths and view the 23 dinosaur cultures that are nestled into the coastal rainforest or 23 dinosaur sculptures. While you may not find Jurassic Park-level action (it might be safer, though) at Prehistoric Gardens, it still invites a sense of wonder—especially the 46-foot-high, 86-foot-long, Brachiosaurus. 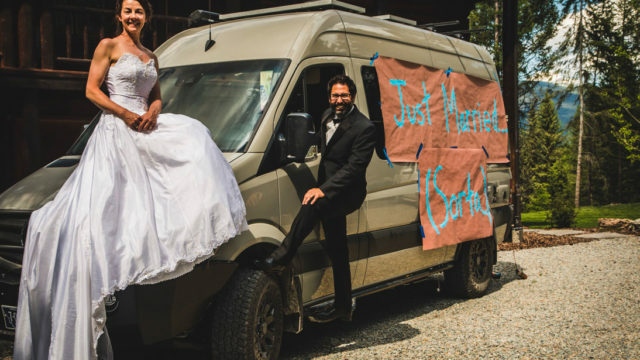 Where to Stay in your ROAMERICA Van Rental: Camp at Humbug Mountain State Park and return to the modern world with flush toilets, running water, and electricity. Built by the Civilian Conservation Corps in the 1930s, the Dee Wright Observatory is not designed for peering into space, although it feels like it belongs on an alien planet. Constructed of lava rocks, the Dee Wright Observatory rises from the rugged landscape to deliver fantastic views of the surrounding Cascades—Mt. Washington; Mt. Jefferson; South, North, and Middle Sister; and even Mt. Hood—with windows specifically positioned to capture particular peaks. 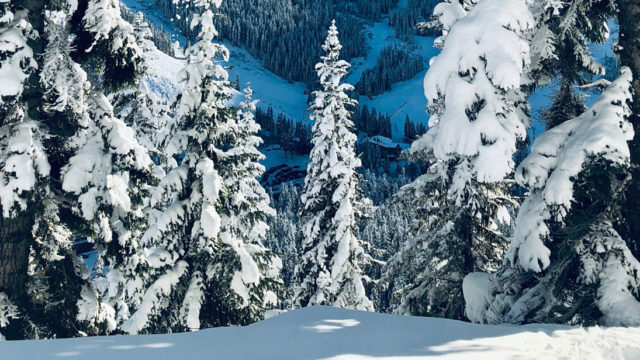 Before you go, know that this hidden gem is only open part of the year, as access is dependent on the Mckenzie Highway (OR 242), which closes in the winter. 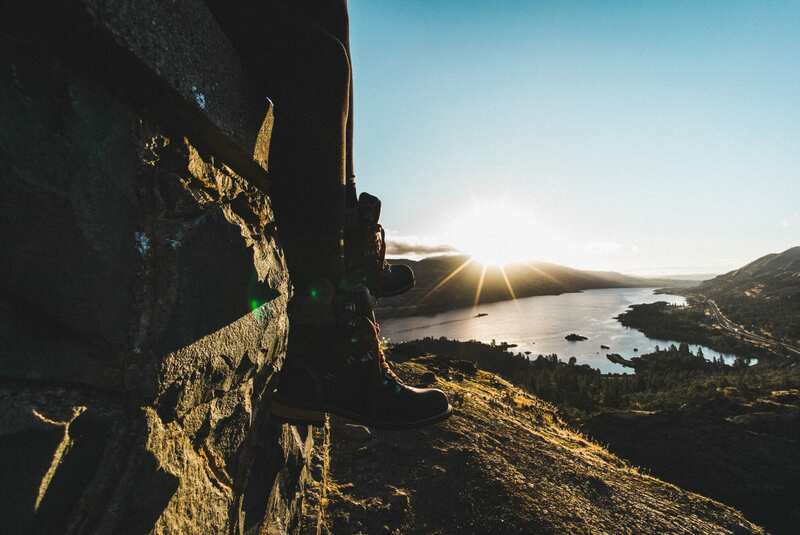 Where to Stay in your ROAMERICA Van Rental: Scott Lake Campground is a hidden treasure in itself, and despite its primitive accommodations, the amazing view of the Three Sisters and its location on the picture-perfect Scott Lake will make you forget all about modern luxuries. Have a little-known destination we need to check out? Let us know about it in the comments!